This week Lainey and Yannick took advantage of the absence of Dave and Caroline to squat The Bugcast’s servers! Barely prepared, with technical configuration they didn’t have three days before, they somehow did a decent job! Watch out for an announcement about a new podcast from a friend of the show! … more on next week’s show! The next live show will be episode 407, broadcast live in the chatroom on Friday 29 April 2016 at 21:30 UK time (BST/GDT/UTC+1). 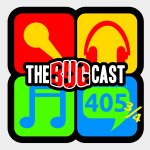 People’s Choice Podcast Awards 2016 – nominations open until Saturday 30 April – please nominate The Bugcast!